The Tibetan monks from the Drepung Gomang Monastary in India, hosted by the Drepung Gomang Center for Engaging Compassion, constructed a Green Tara Sacred Sand Mandala in the lobby of the Kentucky Center for the Arts throughout the 22nd annual Festival of Faiths, April 18-21, 2017. Green Tara, a feminine representation of the Buddha of Compassion, embodies fearlessness, removes obstacles, and offers protection from suffering. In images, she is depicted with an outstretched leg signifying readiness to spring into action in compassion toward suffering beings. 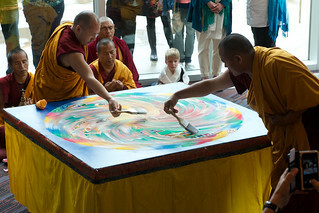 The Green Tara Sand Mandala, a traditional Tibetan Buddhist sacred art design, begins with her image or symbol in the center, surrounded by a detailed and highly symbolic view of the universe in balance. The 2017 Festival "Compassion Shining like the Sun" explored cultivating compassion in our current economic systems, in world affairs and in ourselves. The Festival serves as a platform for conversations on meaning and offers itself as an honest broker and stakeholder in dialogue around authentic compassion.